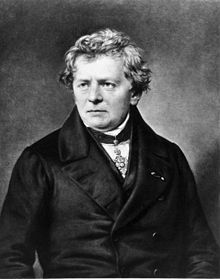 Georg Simon Ohm (16 March 1789 - 6 July 1854) was a German physicist and mathematician. During part of the time in his life, Ohm worked as a school teacher. Some of his research focused on the new electrochemical cell, invented by Italian scientist Alessandro Volta. Using equipment he had created himself, Ohm found that there is a direct proportionality between the potential difference (voltage) applied across a conductor and the resultant electric current. This relationship is known as Ohm's law. In 1881, after his death, the SI unit for electrical resistance was named Ohm in his honour. The uppercase Greek letter Omega (Ω) is used for the unit. This page was last changed on 5 March 2019, at 20:49.